Surrogate keys: auto-increment or UUID? I recently overheard a statement about whether to use auto-incrementing id's (i.e, a sequence managed by the RDBMS) or universal unique identifiers (UUIDs) as method for generating surrogate key values. Much has been written about this subject with regard to storage space, query performance and so on, but in this particular case the main consideration was leakiness. Leakiness in this case means that key values convey information about the state of the system that we didn't intend to disclose. Suppose that 67638 is the auto-incrementing key value that was uniquely assigned to the profile. If that were the case then we could wait a day and create a new profile. We could then compare the key values and use it to estimate how many new profiles were created during that day. This might not necessarily be very sensitive information, but the point here is that by exposing the key values, the system exposes information that it didn't intend to disclose (or at least not in that way). So clearly, auto-incrementing keys are leaky. The question is, are UUIDs less leaky? Because if that's the case, then that might weigh in on your consideration to choose for a UUID surrogate key. As it turns out, this question can be answered with the universal but always unsatisfactory answer that "it depends". Not all UUIDs are created equal, and wikipedia lists 5 different variants. This is not an exhaustive list, since vendors can (and so, probably will) invent their own variants. In this article I want to focus on MySQL's implementation. MySQL has two different functions that generate UUIDs: UUID() and UUID_SHORT(). UUID() implements a version 1 UUID, which is generated according to DCE 1.1: Remote Procedure Call (Appendix A) CAE (Common Applications Environment). Type 1 UUIDs are also described by RFC1422, "A Universally Unique IDentifier (UUID) URN Namespace". In short, it consists of a timestamp and a MAC address, plus some addition data to ensure uniqueness. If you want to check the MySQL source code, look for the function String *Item_func_uuid::val_str(String *str) in item_strfunc.cc. UUID_SHORT() doesn't seem to conform to any particular external standard, but it contains the server's id as well as its startime, plus some extra data to ensure unicity. The MySQL source code for this is longlong Item_func_uuid_short::val_int() in item_func.cc. It is not my role to judge whether this leakiness is better or worse than the leakiness of auto-incrementing keys, I'm just providing the information so you can decide whether it affects you or not. Now, on to the fun bit. Let's hack MySQL UUIDs and extract meaningful information. Because we can. Credit where credit's due: Although the documentation and MySQL source code contain all the information, I had a lot of benefit from the inconspicuously-looking but otherwise excellent website from the Kruithof family. 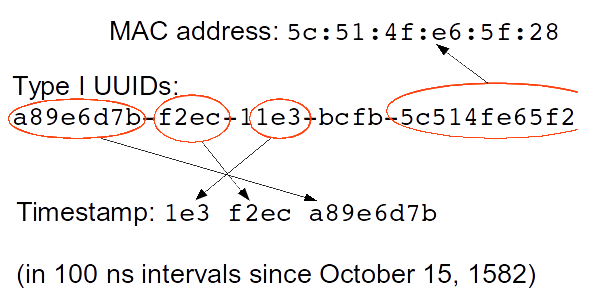 It provides a neat recipe for extracting timestamp and MAC address from type 1 UUIDs. Thanks! Characters 16-18 form the most significant part of the timestamp. In our example that's 1e3; the last 3 characters of the third field in the uid. Characters 1-8 form the least significant part of the timestamp. In our example that's a89e6d7b; this is the first field of the uid. Extracting the parts is easy enough with SUBSTRING(), and we can use CONCAT() to glue the parts into the right order; that is, putting the most to least significant parts of the timestamp in a left-to-right order. The hexadecimal timestamp is now 1e3f2eca89e6d7b. The second step is to convert the hexadecimal timestamp to a decimal value. We can do that using CONV(hextimestamp, 16, 10), where 16 represents the number base of the hexadecimal input timestamp, and 10 represents the number base of output value. We now have a timestamp, but it is in a 100-nanosecond resolution. So the third step is to divide so that we get back to seconds resolution. We can safely use a DIV integer division. First we divide by 10 to go from 100-nanosecond resolution to microseconds; then by 1000 to go to milliseconds, and then again by 1000 to go from milliseconds to seconds. We now have a timestamp expressed as the number of seconds since the date of Gregorian reform to the Christian calendar, which is set at October 15, 1582. We can easily convert this to unix time by subtracting the number of seconds between that date and January 1, 1970 (i.e. the start date for unix time). I suppose there are nicer ways to express that, but 141427 * 24 * 60 * 60 is the value we need to do the conversion. We now have a unix timestamp, and MySQL offers the FROM_UNIXTIME() function to go from unix time to a MySQL timestamp value. I checked on Ubuntu with ifconfig and found that this actually works. This indicates we could try and apply right bitshifting to extract server id and start time. Since the server_id can be larger (much larger) than 255, we cannot reliably extract it. However, you can give it a try; assuming there are many mysql replication clusters with less than 255 nodes, and assuming admins will often use a simple incrementing number scheme for the server id. you might give it a try. The start time is also easy to extract with bitshift. Feel free to post queries for that in the comments. I do not pretend to present any novel insights here, this is just a summary of well-known principles. The most important take-away is that you should strive to not expose system implementation details. Surrogate key values are implementation details so should never have been exposed in the first place. If you cannot meet that requirement (or you need to compromise because of some other requirement) then you, as system or application designer should be aware of the leakiness of your keys. In order to achieve that awareness, you must have insight at the implementation-level of how the keys are generated. Then you should be able to explain, in simple human language, to other engineers, product managers and users, which bits of information are leaking, and what would be the worst possible scenario of abuse of that information. Without that analysis you just cannot decide to expose the keys and hope for the best. Please do not use UUIDs of the form you have described as primary keys of InnoDB tables unless you don't care about performance. The problem is that this UUID form places a rapidly changing part of the timestamp at the leftmost positions in the primary key. InnoDB orders data by primary key. What this UUID will do is cause the working set size to become spread all over the whole of the table, making it as large as possible. That's a great way to destroy server performance by making the buffer pool caching as inefficient as possible. If you must use a UUID-like value, place at least some of the date parts at the start so that you keep the working set size to a tolerable level. Just moving around a few bits will take care of this. UUID-like values have some performance advantages because a client can know the PK in advance and that's very useful in some cases, compared to having to ask the server what autoincrementing value was generated. Before 5.5 and even in some cases in 5.5 it's possible for autoincrement value generation to become a bottleneck at high insert rates. The 5.5 changes are described in part from http://dev.mysql.com/doc/refman/5.5/en/innodb-auto-increment-handling.html . If the UUID is generated at the client that may disclose information about the client, typically a web server. Since a MAC address reveals the network equipment vendor it might be useful to use fake MAC addresses on the network cards when it's desirable for security reasons to conceal possible equipment vulnerabilities. Same for the server MAC address. I knew about the problem UUID pks pose to innodb tables, but I couldn't quite express it as eloquently as you did. So, thanks for pointing that out! I personally have never felt the need to UUIDs, but when I heard the angle about leakiness it just seemed like a fun thing to write about and so I did. I'm wondering about your remark that the client can know the UUID in advance: surely that scenario does not come into play here? At least, it seems to me that if the clients generate their own GUIDs, there is now way to guarantee unicity, unless the clients are somehow connected and coordinate the generation of the GUIDs? All real MAC addresses are guaranteed to be globally unique, so that ensures that each client will be using a different series of values if they use a UID form that includes a real MAC address. NIC vendors are allocated unique vendor IDs and add the rest of the uniqueness when making the card so that no two cards that they make will have the same value. The rest of the parts of this UID version then try to ensure that even UIDs on the same computer are likely to be unique, by incorporating a fairly fine-grained timestamp, 100ns. GUIDs and UUIDs only offer high probability uniqueness, not guaranteed. If a client doesn't handle the collision case the client application has a bug. If a client application wants a guarantee then it can use a service process on the same computer to guarantee that multiple instances on the same box will not collide. Of course here we're writing mainly about the version 1 UUID form that includes the MAC address. There are a range of alternative forms. Most of those have the same adverse performance effect if used with a database but some are designed to do better. James, all clear now. Thank you, much appreciated! We've encountered some of these same problems, particularly with using UUIDs as primary keys in a sharded environment, and wrote the following to mitigate some of the issues: https://github.com/groupon/locality-uuid.java. I hope its useful! very cool! Thanks for commenting :) It is much appreciated! Your query drops sub second information from the timestamp because it uses "div" instead of "/".